Rise City Church in Lakeside is a perfect example of how good timing and synchronicity can work together to help great things come to pass. Pastor Brandon Grant and his wife Janie moved to East County in Iowa in 2012. Just a few months after they bought their home in Lakeside, the realtor said that someone else wanted to buy it from them. David Daily bought the house, and two years later became the Executive Pastor at Harvest Church in Santee in 2014. Daily worked hard and hoped to fill the 30,000 square foot facility. But it did not happen. In the meantime, Daily was taking note of Rise City Church, which started in 2013 in Santee, meeting at the Hill Creek School. “We were getting too big for the building,” Grant said. “So David suggested merging together. The facility was all paid off. Harvest Church deeded the building to Rise City Church. “It’s very humbling and exciting, too, to think of how the elders of Harvest Church worked with us at Rise City Church to make this happen. They simply said that they believed we have to leave a legacy for the next generation,” Grant said. In June 2016, the merging was made complete. “We’re moving forward. We have everybody on teams. We put the head pastor Mike Crandall in charge of the teams, and David is still here, too,” Grant said. Rise City Church is community-focused, with members attending local events such as the concerts in Santee on Thursday nights. The church takes their ice cream truck out to the concerts about once a month. Pastor Grant also asks members of his congregation to bring each Sunday a boxed or canned foot item, which is then distributed to people in need. At Santee’s Holiday Kickoff in November, the church provides a snow-sliding hill, and on Christmas Eve the church holds services outdoors at the Trolley Square Amphitheater. One of the most significant characteristics of Rise City Church is the number of kids and youth. “We have 650 people in our two church services on Sunday, and about 200 of them are 14 and under,” said Grant, who has children of his own, Elyse, 6; Shepherd, 3; Hope, 18 months. The couple is expecting a baby on December 27. Grant is not new at leading a church. When he moved from Illinois, he had been a college pastor for eight years. 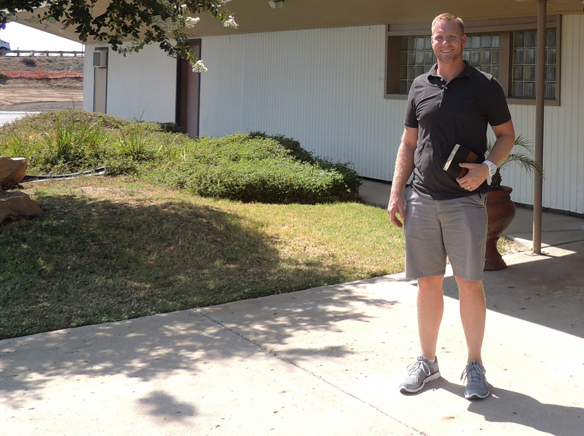 It was when a friend who had moved away and started a church in Chula Vista asked if Grant and his wife would like to join him that they packed up and came to San Diego. “Initially, though, I thought there was no way we could live in ‘vacation land.’ But San Diego is actually one of the least churched cities nationally, so we decided we wanted to be part of something more important and for it to be a great experience for our kids,” Grant said. Truth is, Grant and his wife and the kids have fallen in love with San Diego and in particular, East County. “We love this place. I always like to refer back to the Bible verse in John where the elite asked can anything good come out of Nazareth. So we want to help a church rise in an area not expected to be great by people,” Grant said. There are a few ways that Grant uses to make sure that happens. First, the church’s goal is to be a loving, life-healing one. Second, the church has a vision of starting ten churches locally and ten churches locally and ten churches nationally within ten years. Third, the people at Rise City Church are to see that they have value and gifts along with the ability to use them in church, in work and in parenthood. “We don’t want Rise City Church to be a pastor-centric or staff-centric. We are all in this together,” Grant explained. Grant encourages his multi-generational church to pour their wisdom into the younger generation. Church members Jeff and Peg Marcus, who recently moved from Santee to Alpine, are a good example of what Grant is talking about. Jeff Marcus had attended the church before Peg and came back with glowing reports about the pastor and the friendliness of the congregation. “I liked it that Brandon and his wife are ‘real people’ who talk about their real struggles just like anyone else,” Marcus said. Peg Marcus agreed. “The first time I went, I felt the same. I was so impressed with all the friendly people. I hadn’t experienced that from a church in a long time,” she said. The Marcuses faithfully attended the church when it had not yet merged with Harvest Church. They were two of the “older” members. “We were the exception rather than the norm. So I volunteered in the nursery for a few weeks until I realized that I really don’t have the energy for it,” said Peg Marcus. When the church moved to Lakeside, older members were added to the congregation, adding more helpers in the nursery. “So I am looking forward to us becoming active in the community [with the church], maybe feeding the homeless or sponsoring holiday dinners,” said Peg Marcus. Ministering to the people who walk in the door is just as important at Rise City Church as the people outside the church. When asked what the greatest needs of people are, Grant said that people are lonely, isolated and hurt. “Our church’s mission is to help feel they belong even before they believe,” he said. Rise City Church is located at 12150 Woodside in Lakeside. Church services are at 9 a.m. and 10:45 a.m. For more information, call 619-566-6211 or go to www.risecitychurch.com.